Sade is smooth. We all know this. The sound of Sade is the sound of smoothness itself. But listening to this album has taught me things I didn’t know too. One of them is that Sade is actually a band. The band’s vocalist is Sade, obviously, but Sade is actually a member of Sade, whose other members are called Andrew, Stuart and Paul. Those names aren’t smooth, which explains why the band is just called “Sade” and not “Sade, Andrew, Stuart and Paul”. The other thing I learned is that I know more Sade songs than I thought. I thought I would know maybe one or two of these, but it turns out I knew at least seven of them. My life is, as a result, at least 350% smoother than I had previously realised. * Another name for the pan pipes that begins with an S.
It is surprisingly hard not to like this album. I’m not saying I actually like Sade because I’m not sure I actually do, but it’s so incredibly inoffensive and easy to listen to that it’s difficult to identify anything in particular to dislike. Most of the songs were nice background music. The overall smoothness is almost overwhelming, washing over you in a way that’s impossible to fight. It’s like listening to a silent tidal wave of Golden Syrup. My favourite thing about this album is how well organised it is. Most people throw a Best Of together without really thinking about it, but Sade (the person or the band, I don’t know which) has been admirably tidy and focussed by putting all the tracks from their first album first, then all the tracks from their second album, and so on. A further improvement might have been to assign each track a number from the Dewey Decimal Classification System, but failing that they have made a good start on keeping an organised album. My least favourite thing is the last track, which says that an old woman dying in Somalia “hurts like brand new shoes”. 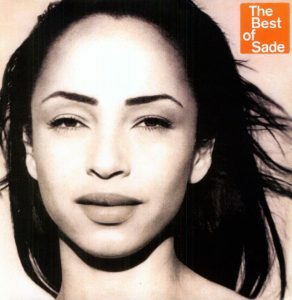 The picture on the front of the CD, which Sade is that Sade? That’s the band Sade, but it was taken very close up. The whole band are there, all posing moodily, it’s just that the other ones aren’t actually visible in shot. How many Sades could you fit into a lift? You can choose whichever Sade you would like in your response. Since one Sade is a quarter of a Sade, this is a confusing system of measurement. It also depends on the size of the lift. Therefore, in response, I would have to say the answer is: some Sade. I hope this conclusively and accurately answers your question. That is, unless, you want to tell me how many Sades it takes to change a lightbulb? I think I have this worked out now. The number of Sades needed to change a lightbulb is one Sade, which could also be expressed as 0.25 megaSades. I think I’ve almost finished my Sade maths worksheet. If I could just ask one further question. One Sade is on a train going at 30mph and one Sade is on another train going at 40mph. Is that the question or is there more? The first Sade leaves Edinburgh at 9.00am whilst the second Sade leaves York at 10.00am. At what point do the Sades pass each other? The answer is just after track nine. I think we all know that THAT is clearly in the bag. It’s so in the bag it could be Schrodinger’s cat.